There are many people who are planning to start the keto diet. They have planned everything from the healthy fatty ingredients that they are going to use in their diet to how they are planning to maintain the level of proteins in their body. They have even prepared their list of ingredients and all other items that they need to assure that they will not have to deal with any issues while following the keto diet. However, a common issue that people have to deal with while following the keto diet is that they get bored with the food they are consuming. There are many people who complain that the food is not very interesting and flavorful. This is the reason they are unable to maintain the diet plan. In order to deal with this issue, they have to add flavors to their meal and they do not know how to make it possible. You should know that there are various types of recipes available online that can help you prepare a perfect meal. If you are craving for some delicious fast food, there is no need to go anywhere else. We have for you the perfect 4 Keto Quesadillas recipes. You can easily enjoy the homemade goodness of the Quesadillas without worrying about any low-quality ingredients. Creamy keto quesadillas is the best products available in the market. It is filled with creamy deliciousness that would be hard for you to ignore. Here is the list of all the ingredients that you need for the preparation of keto quesadillas. Take a mixing bowl and add coconut flour and egg in it. Mix it properly to assure that it is smooth. Take a pan and it keep it on medium heat. Add olive oil to the main and wait until it is hot. You have to pour the mixture into the pan and cook it properly into a tortilla. You have to cook your tortilla just like a pan cake from both sides. Take another sauce pain and melt your parmesan and cream cheese in it. Add spinach and mushrooms into the melted cheese and sauté it properly. Once the mixture is prepared and cooked properly you have to add it onto your tortillas that you have prepared previously. Fold on one side and enjoy your perfect meal. In case you think your diet is getting low on proteins you can enjoy this high protein keto quesadillas. Here is the complete recipe that you have to follow. The ingredients that you need for your keto quesadillas are. Here is the complete guideline for the preparation of keto quesadillas. Take a cast iron skillet and keep it over a medium heat. Add avocado oil to heat it properly. In the heated oil you have to add your chicken and fry it properly. Once it is fried you can add your veggies. Keep them crunchy or soft the way that you like. Evenly cook your meal and add your favorite dressing into the pan to add more flavor to the meal. Take another bowl and add cheese and dressings to it. Mix it properly until it is smooth and cheese is evenly coated. Once the tortillas are cooked you have to set them on a plate. Spread the cheese properly and add the mixture of chicken and veggies to the mixture. After that add more cheese. Fold your tortilla in half and pat with the spatula to assure that it is set properly. Serve while it is hot with your favorite keto drink. Here we have one of the best keto quesadillas that you can enjoy at any moment that you like. The best thing about this keto quesadilla is that you can even prepare it for your guests and show them your amazing cooking skills. The list of ingredients that you need for the preparation of your keto quesadillas are. Here is the step by step guide that you need to follow for your keto quesadillas. Take a frying pan and heat 1 teaspoon of olive oil in it. Add sausage patties into the pan over the medium heat and cook it properly. You have to assure that it is brown on both side. It will take 3 to 4 minutes to prepare the sausage. Once prepared place the sausages on a cutting board and cut them in half. Add a small amount of oil on the pan again and cook your tortillas properly. Once the tortillas are cooked you have to sprinkle them with cheese to slightly cover the surface. After that place your sausages on the tortilla and fold them in half. Keep the tortillas on the pan for a few more minutes to assure that the inside is cooked and the cheese is properly melted in the tortilla. You can add your favorite dressing into the tortilla that you like and serve while it is hot. It is one of the best and most delicious keto quesadillas that you could make at home. It has just the right amount of protein and other nutrients that will allow you to enjoy the healthy meal in the most efficient way. For chicken keto quesadillas you will need the following ingredients. 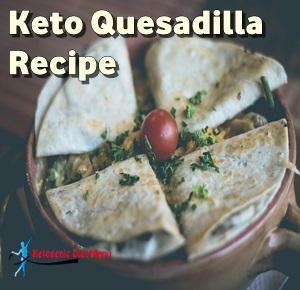 Here is the step by step guide that you need to follow for the keto quesadillas. Grill the chicken properly o the pan. You can grill your vegetables as well if you like or you can enjoy them fresh in the quesadilla. Once the chicken and vegetables are prepared, heat the pan again to cook your tortillas on it. Cook the tortillas on both sides and place the cheese on one side and cover it with chicken. Wait until the cheese has melted, fold the tortilla and serve while it is hot. Make sure that when you plan to prepare the Keto Quesadillas you get all the fresh and organic ingredients. That is the only way you will be able to enjoy the nutritional benefits that come with the product. Make sure that you enjoy your meal with your favorite sauces. If you would like to add some sides of vegetable salad or other nutritional elements, you are free to add more flavors to your meal. You can also make a fresh drink with your meal to assure that you can enjoy it in the best possible way. Enjoy your keto quesadillas and step away from the carbs.